(June, 2018) Hello to all. 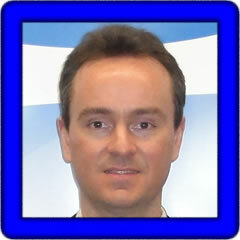 My name is Pedro Monteiro da Silva Eleuterio and I was born in 1977, in the city of Araraquara, Sao Paulo state, Brazil. Around 1990, my mother, Leonor, who had studied piano in her youth, bought an electronic organ to resume her studies and hobby. With this musical instrument at home, I watched my mother playing, which awakened my desire to learn it fast. I already knew how to read musical notes, which I learned in school, and I asked my mother how to play those written notes on the keyboards of the electronic organ. In only 5 days, I could play my first full song: Rendez Vous - Jean Michel Jarre, including the left hand and foot (bass pedal board). After three months playing day and night, instructed by my mother, the boy of only 13 years started attending electronic organ classes with a professional teacher (Solange was her name). In 1991, By studying day and night, I finished the 3-year electronic organ course in only 10 months. In 1992, I bought my first keyboard, the Yamaha PSR-200. From there, I just used my free time at the keyboard, playing several times a day, due to better sound quality and realism in relation to the electronic organ. I soon exhausted all the features of the small keyboard. Thus, in 1993, I bought the PSR-400. From there, I always wanted a better keyboard, because I needed more and more styles, more sounds, more features, and of course, more realism and quality. Since my first arranger keyboard, I always played with live styles since I never liked using midi or recorded accompaniments. After the PSR-400, I bought the PSR-520 and then in 1998, I changed to the PSR-730 when I was traveling to the United States to learn English. I started teaching classes for advanced keyboard students on how to use the keyboard features to improve the overall quality of produced music. Surely, the PSR-730 was one of my favorite keyboards and most caught my attention. In 2003, I changed the PSR-730 for a PSR-2000. From there, I started to play professionally at some events, such as dinners, weddings and restaurants, but always devoting more time to my favorite hobby - playing for myself and for my friends and family -- my mother is always my biggest fan. In 2009, I sold my PSR-2000 and bought the brand new PSR-S910. In 2010, I was surprised with an advertisement for an used Tyros 3, it was my dream keyboard at the time, at a great price, and I was able to upgrade to my current keyboard, the Tyros 3, which is my first professional keyboard (the previous ones were semi-professional). Throughout my musical career, I have always used Yamaha keyboards and played with styles, and I could see the tremendous technological progress each time I exchanged for a newer model. In 2011, I recorded some videos of my performance with Tyros 3, which are available on Youtube, at the channel pedromseleuterio. Through more than 20 years of musical experience, I never stopped playing, and I intend to return to play professional in events and gatherings. I upgraded the Tyros 3 to a Tyros 4 in the beginning of 2014, which was a great improvement, since the new Chorus voices were really amazing. But, the most advanced upgrade happened in 2018, when I bought the new Yamaha Genos. For me, it's unbelievable the sound quality, mainly the new voices, including heavy drum and bass, outstand new styles. You most hear it live to believe. I'm playing in a Pink Floyd cover band too, with complete band, just for the keyboards sounds (and Brass/Sax also). It's the definition of an equip – everyone must be on the right place at the right time. In my personal opinion, the Yamaha keyboards are perfect for those who play alone and need quality styles and real-time features. The styles are undoubtedly the best in the market and easy to use. Congratulations to Yamaha, I am a fan of these keyboards since I was 13 years old and will not stop playing. A hug to everyone. I hope you appreciate my music and my videos. Regards!!! Recent songs are in the Jukebox above. The list below includes all of Pedro's songs arranged alphabetically by song title and keyboard. Click on the song title to listen to and/or download the song.